Welcome to Thank Goodness It’s Finished Friday! I’m thrilled to be hosting this week’s edition of TGIFF! I just finished this ABC quilt for my daughter. I’m calling it, “Keep Learning!” I learned a few new animals from this panel by Lisa DeJohn. Am I the only one who had never heard of a xantus?!? I purchased a kit for this quilt a while ago, but just got around to using it. The kit uses the Chain Reaction pattern by Cluck Cluck Sew with a few adjustments. I made even more adjustments by adding some fabrics from my stash and a border. I left the animals unquilted. I couldn’t bear the thought of stitching over these little creatures. Instead, I outlined the white frames and stippled the background. My favorite animal in the collection is the elephant. Check out those eyelashes! And this ant is the only kind that I find cute. For the back, I added a piece of the collection that has a collage of the animals. Voilà! I’ve got a I-spy quilt on the back! I can’t wait to see my little girl’s face when I give her this quilt! So, what about you? Any finishes to share? Link up all those amazing finishes right here. And be sure to check out the other finishes and share some comment love! Please include a link and/or button for TGIFF! so that your visitors can see the other amazing finishes. Awww, I love the little "the end" block! I love the aqua colour you have set your blocks in – and how the overall effect is abacus-like. A great finish! Nicole, this quilt is adorable! The workmanship and speed in which you got this accomplished is impressive! Your daughter is a very lucky girl to have such a talented and thoughtful mother. I have a great big smile on my face. It looks fantastic Nicole! I love it with the aqua! And, wow, your daughter will be teaching the class when it comes to animals! This turned out even more adorable than I thought it would…and I thought it was pretty darn cute to start with. Well done, Nicole!! This turned out SO darling, Nicole! You have such a knack – just a wonderful design for the little alphabet squares! Great quilt! It's so very sweet and a great way to use an alphabet panel! Love the pattern too. Bet your daughter will be thrilled! What a great quilt! That is such a lovely shade of blue and those animals are so cute! Good work on the quilting, it really brings out the animal blocks. She is going to LOVE it! What a gorgeous quilt! The colour is gorgeous and the animal alphabet is beautiful- well done! it went out so well! I love these animals really! This is my first visit to your blog and I love that finished quilt. I especially love the contrast with the blue and the white stripes – and then the BACK – with that stippling and then not quilting the alphabet squares, plus the colours and strip of I-Spy fabric – well you have 2 quilts in one! Fabulous work. Thanks for hosting today Nicole. Oh my, it's too cute. Your little one will be excited, I'm sure. Good call on not quilting over the animals. It's turned out great! That's wonderful! I love that it has non-traditional things for the letters. Where did you get it from? OMG, I LOVE your quilts, so much creativity and inspiration!! Nicole, your ABC quilt is so awesome. And I'm with you, never heard of xantus before. Your little girl is going to love it, the strip in the back is cute too so she can search for all the animals from the front. I have a quilt finish to share too, just waiting for my kids to get up so I can photograph it!! Oh my goodness – this quilt is absolutely adorable!! I love it!! Nicole, your quilt is just lovely! I have one for our girls (though not as nice) and I actually hung it on the wall. We refer to it regularly for alphabet help! It came out great! I love that pattern too! I just printed it out from Cluck Cluck Sew the other day and am trying to find away to use my stash to make it! I absolutely love this quilt. The colors are gorgeous and will surely make your little girl happy! oh wow, look at you, you have really made a wonderful quilt again. So very cool. Your little girl is going to love this. And so much love obvioulsly went into it. Nicole this turned out so great! Your daughter will love it for sure. And no, I had no idea what a xantus is!! It looks fab, and I'm sure she'll adore it! What a beautiful quilt! I really love the borders you added and that blue fabric for the background is SO pretty. Is that Sketch? Looks great! I love how the white line ties the squares together. You finished!! Wow!! You are fast. It looks wonderful. Your daughter will spend countless hours learning. 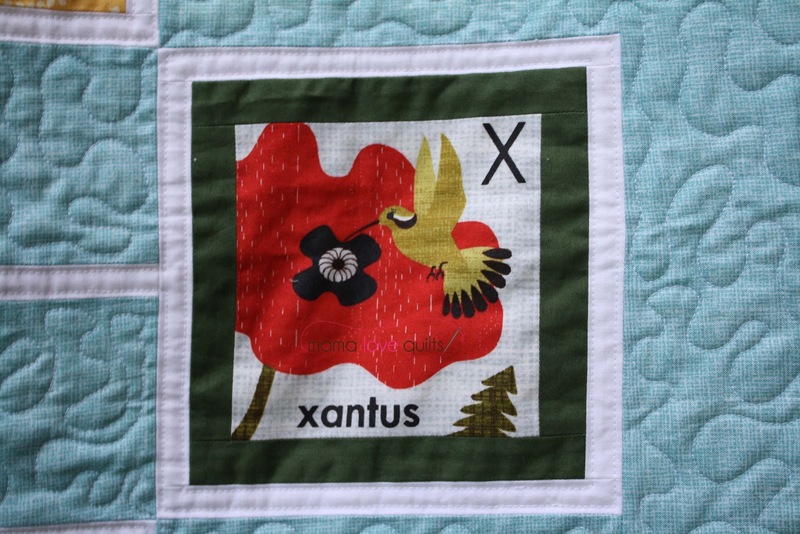 Is xantus the bird or the flower. I love this finish. I have two little girls, as well. My oldest is also 4, and the younger just turned 2 Thursday.